In computing, phishing is a criminal activity using social engineering techniques. Phishers attempt to fraudulently acquire sensitive information, such as passwords and credit card details, by masquerading as a trustworthy person or business in an electronic communication. Phishing is typically carried out using email or an instant message, although phone contact has been used as well. Attempts to deal with the growing number of reported phishing incidents include legislation, user training, and technical measures. The first recorded mention of phishing is on the alt.online-service.america-online Usenet newsgroup on January 2, 1996, although the term may have appeared even earlier in the print edition of the hacker magazine 2600. The term phishing is a variant of fishing, probably influenced by phreaking, and alludes to the use of increasingly sophisticated lures to “fish” for users’ financial information and passwords. The word may also be linked to leetspeak, in which ph is a common substitution for f.
2. At the link in the email where they ask you to click to confirm your email account, the link displayed is only https://www.paypal.com/cgi-bin/webscr?cmd=login-run which is actually a valid login site at PayPal. However, there is a hidden section in that link with your click being forwarded to a dns.nic.bs website. Sites have added verification tools that allow users to see a secret image that the user selected in advance; if the image does not appear, then the site is not legitimate. Bank of America uses this together with challenge questions, which ask the user for information that should be known only to the user and the bank. Anti-Phishing Working Group – News about phishing and anti-phishing control methods. Bank Safe Online – Advice to UK consumers regarding phishing. 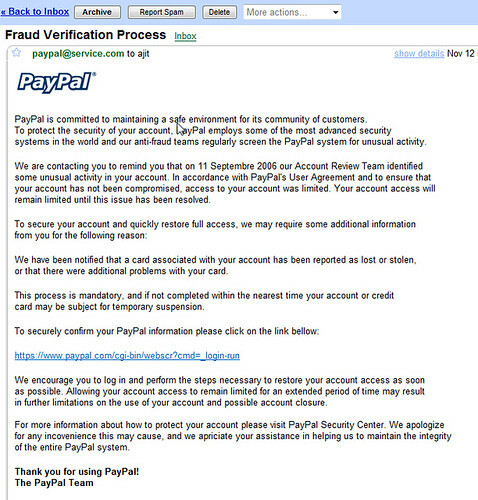 Banking Scam Revealed – A public forensic examination of a phishing attack. CIMIP – Center for Identity Management and Information Protection. Duke Law & Technology Review – Plugging the “phishing” hole: legislation versus technology. FBI E-scams and Warnings Update – Summaries of new or active scams that use the web or e-mail. FTC Consumer Alert – How not to get hooked by a phishing scam. How Phishing Actually Works – How the bad guys actually operate. Indiana University Phishing Group – Collection of research articles on phishing. Know Your Enemy: Phishing – Case study from the Honeynet Project on detailed techniques of a couple of phishers. Phishing Detection and Prevention: Practical Counter-Fraud Solutions – Industry whitepaper exploring various counter-fraud techniques. The Phishing Guide: Understanding and Preventing Phishing Attacks – The technologies and security flaws phishers exploit. Phishing IQ Test – Find out how well you can recognize a Phishing email. Phishing mailing list – Phishing discussion, research and mitigation. Phishing scams gallery – A large and growing gallery of phishing examples. 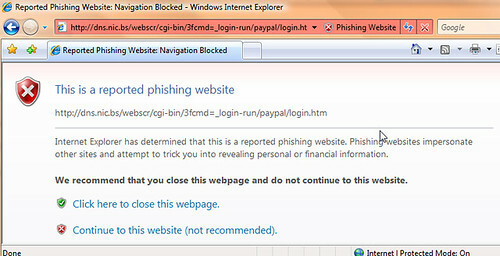 Spot phishing scams – Recognize Phishing Scams.